Blueberry farmer Misty Hart hears an eerie voice floating through the trees. Before she knows it, she’s in the middle of a mystery involving an abducted parrot, a missing treasure and a political feud. If she doesn’t get to the bottom of the mess quickly, someone will put her on ice faster than her famous pies. 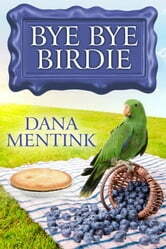 At the end of this short cozy mystery is the recipe for Misty’s blueberry pie filling.